What sets AON apart from other invention service companies? We are inventors ourselves and have worked with hundreds of other inventors, consumer-goods companies, and major retailers over the years. We have experience in practically every merchandise category you can think of, from automotive to pharmaceuticals and everything in between. The bottom line? We know what we are doing and understand the challenges of taking products to market. This experience can be a two-edged sword, since we often find it necessary to advise customers not to go forward with a particular invention. Regardless of our recommendation, for your specific invention, you can be sure that we take this process very seriously, even to the point of establishing an independent “Ethics Committee” to assure our customers that AON Invent is living up to our commitment of setting a new standard for ethics in the invention-service and submission industry. Why would you advise someone not to pursue an invention idea? No inventor wants to hear that verdict, but an honest “no” is much easier on your pocketbook than a rubber-stamped “yes” that you might get elsewhere. We routinely hear from inventors who have told us about spending tens of thousands of dollars to protect and develop their invention, only to realize they had made a very costly mistake. They chose to work with people who told them what they wanted to hear, instead of experienced professionals who would focus on the invention and tell them what they needed to hear. Why does AON charge a fee just to look at an invention? If there was a fair way to vet product concepts for free and only charge for those that make millions of dollars, we would do just that! But that would mean each successful inventor would have to pay for all the concepts that have little or no commercial value. That would dramatically inflate development cost. We believe AON’s value proposition is equitable for all parties. In fact, the way in which AON uses its portion of the licensing revenue is of great benefit to both the inventor and the licensee, because it offsets the manufacturer’s design costs and helps reduce time-to-market, often by 6-12 months. How do I know you won't just take my money and blow me off with a 'NO'? We make decisions on the basis of what makes sense for you, the inventor, rather than what makes dollars for us. Were that not the case, we would eliminate the preliminary vetting process (Step 2) altogether and encourage everyone who visits our office or website to purchase our full service (Step 3). There are A LOT of companies out there that will tell you what you want to hear and take your money, but we believe it our responsibility to offer unbiased professional opinions, though it is less profitable for AON. To look at it in another way, when we assign a 1-star or 2-star rating to an invention, it is our way of preventing someone from wasting great sums of money. What guarantees can you offer me? We understand how difficult it is for any inventor to accept an unfavorable review of their concept, but we stand behind our panel’s assessments and offer the following guarantee: If you find commercial success with your invention after we have assessed a 1-star or 2-star concept, by developing it yourself or with the aid of another invention service company, AON will publicly congratulate you here on our website and send you a check for five times the amount you paid us for our consultation services. Why do you minimize the inventor’s input with product companies? We know inventors. They are passionate about their vision and usually emotionally-attached to their invention. We also know consumer goods companies. They make decisions based purely on their experience of “what sells and what smells.” In their world there is little room for emotional attachment, unless it will sell more merchandise. They like things concise and pragmatic and generally choose to isolate themselves from any connection. An emotional plea can even have the opposite effect of what is intended! There is a reason they generally don’t accept ideas directly from inventors. Why do you ask to take control of the process? Our model is set up to gain control of all aspects of the process surrounding your invention, so that we can present it in a manner acceptable to CPG companies. We know the best way to sell your product is if you allow our experts to be experts without their hands tied. Getting your product to market is not an exact science, but it stands to reason your chances improve if you allow yourself to benefit from the expertise you are paying for. How do I know that you are not trying to steal my idea? Any control we leverage over your product is simply so that we can sell it. After ten months, if we have been unsuccessful in getting your product to market, all rights will be returned to you with time for you to gain a full patent. You also have a Non-Disclosure Agreement with us, and you own the provisional patent. Lastly, if we were to steal your idea, you would move on to other great ideas, but we would lose all credibility and possibly our business. Who has more at stake in this? And in our concerted effort to set a new standard for ethics in the invention service and submission industry, we established an outside ethics committee to see to it that we maintain the highest standards of ethics and integrity. I have been told not to trust a company that offers legal help and inventor services. That advice was likely very good. The reason for our unique setup is that we need to offer great service to inventors as well as Consumer Product Companies. If we present a product that is not patentable, original, or sufficiently protected, we lose credibility with professional companies, which hurts everyone involved. For this reason, we evaluate EVERY product and protect it ourselves. If you already have a provisional patent, a full patent, or have done a patent search, we will consider these, but we will not automatically accept them. Many companies offer lack-luster performance and leave your product under-protected or the current market situation suspect. Our legal services are contracted through a reputable, licensed patent attorney who offers a significant discount to AON Invent. If my product does not make it through the system, will I get my money back? You will be refunded the portion of your upfront fee that has not been spent. Our fee is based on real services that you receive. If we pay for a patent search and discover your idea is not original, you will receive your money back minus the attorney cost for the search and the original consultation. If you receive a rejection by the panel, the refund may be minimal, as this is the last stage of the process before the product is placed within the Silo. How do you protect me from losing money? Your product will be assessed by one of our retail experts through an initial vetting. If we consider your product commercially viable, we will tell you so before asking you to invest any money in the process. The board will do the same thing. This is why we have a three-step process: we take “baby steps” to make sure you don’t throw your life savings into a bottomless pit with little or no hope of return. How does AON stop this process from being a bottomless pit? Your upfront fees for Step Two and Step Three are all you will ever pay us. If your product is picked up by a corporation, they will pay the fees to develop it, prototype it, manufacture it, etc. How do I know that people are actually looking at my invention? All viewing is done online, so we can track the number of companies that view your product in the Silo, and we ask them to rate it and make comments. This is significantly different from the traditional model of a promise to send your invention out to a few companies in an unvetted format. Every person that has access to your invention has signed up with us, because they are interested in innovations just like yours and are actively involved in taking ideas to market for major retailers. Glad you asked! The first step is to go through our (aptly named) Step One Blueprint. This will walk you through some methods to quickly validate your idea before scheduling a consultation with us. It’s totally free and available to download in the box below. 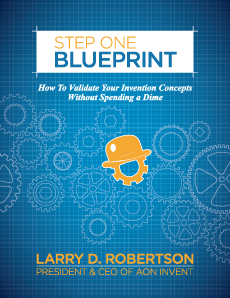 Here is your free Step One Blueprint that has saved countless inventors time and money. If you believe you have a good idea for an innovative product, it is absolutely vital that you read this BEFORE spending a dime with us or anyone else. It contains simple techniques that could either make you money or save you money, but failing to read it could cost you thousands.